A Book Review for You: Meow! Purrrr! Love Cats? Have I got a book review for you? Read on..
Meow! Purrrr! Love Cats? Have I got a book review for you? Read on.. 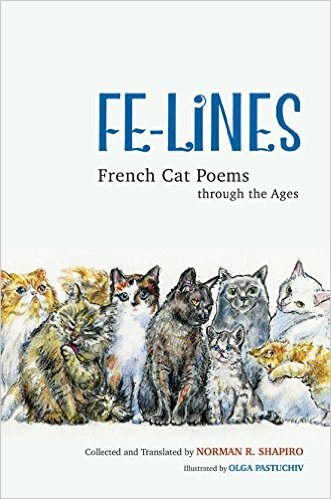 The French have long had a love affair with the cat, expressed through centuries of poetry portraying the animal's wit and wonder. Norman R. Shapiro lionizes the felines' limitless allure in this one-of-a-kind collection. Spanning centuries and styles, he draws on she-cats and toms, and an honor roll of French poets, well known and lesser known, who have served as their devoted champions. 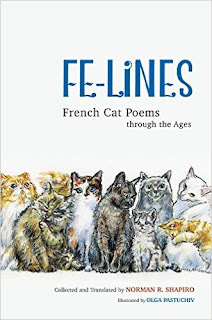 He reveals the remarkable range of French cat poems, with most works presented here for the first time in English translation. Scrupulously devoted to evoking the meaning and music of the originals, Shapiro also respects the works' formal structures. Pairing his translations with Olga Pastuchiv's elegant illustrations, Fe-Lines guides the reader through the marvels and inscrutabilities of the Mystique feline. The French aren’t the only ones that love cats, but this book shows how much their love affair with the cat is. I love cats and poetry. Hence, this was a natural read for me. I love this book and highly recommend it. Author Norman Shapiro translates the poems, and then provides the originals in the back of the book, making this volume ideal for those who read either or both English and French. Of course, this book is all about cats. The poems cover the modern and classic.